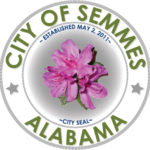 The Semmes City Council meets on the first and third Tuesday of each month. Regular Council Meeting begins at 4:00 p.m.
7875 Moffett Road Unit #C (in the same complex as City Hall Offices). All cell phones must be turned off or are on silent to avoid any unnecessary interruptions in the meeting. Any person desiring to address the Council must register and complete the request to speak form upon entering the meeting area. Please give the completed form to the City Clerk prior to the meeting being called to order. Public Comments are ONLY allowed during the Public Comment portion of the meeting. When addressing the City Council, the speaker must state his/her name and address. To maintain the decorum of the meeting of the meeting, there will be no undue applause and/or public outcry allowed. This is a meeting of the City Council and not an open public forum.